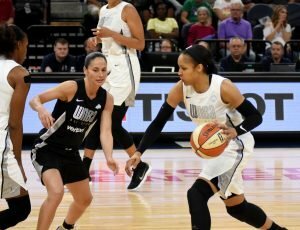 Maya Moore dribbles up court while Sue Bird defends her. Maggi Stivers/WomensHoopsWorld. 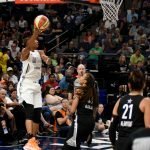 Minneapolis – When Maya Moore drained a transition three-pointer with 1:26 left in Saturday’s WNBA All-Star Game, she added a staredown to it. It was a look that said that this was her house, and this was her game. 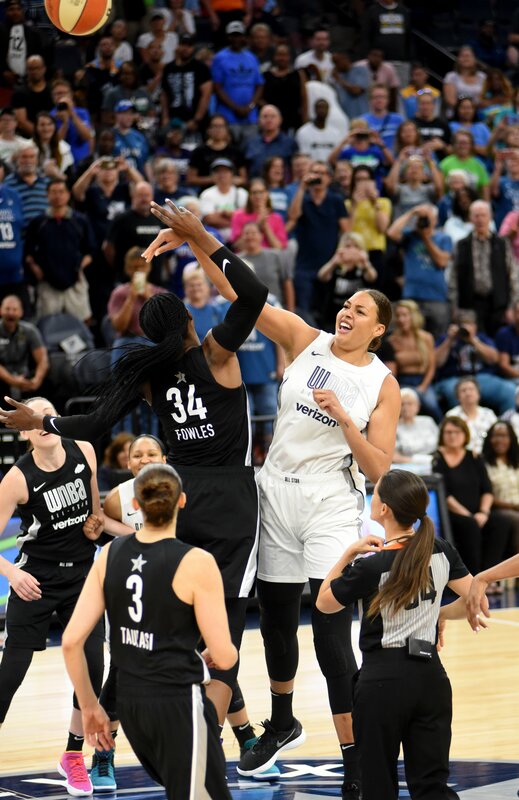 Moore’s basket gave Team Parker a six-point lead, and it turned out to be the eventual game-winner in Saturday’s 119-112 decision over Team Delle Donne, in front of a raucous crowd of 15,922 at the Target Center. 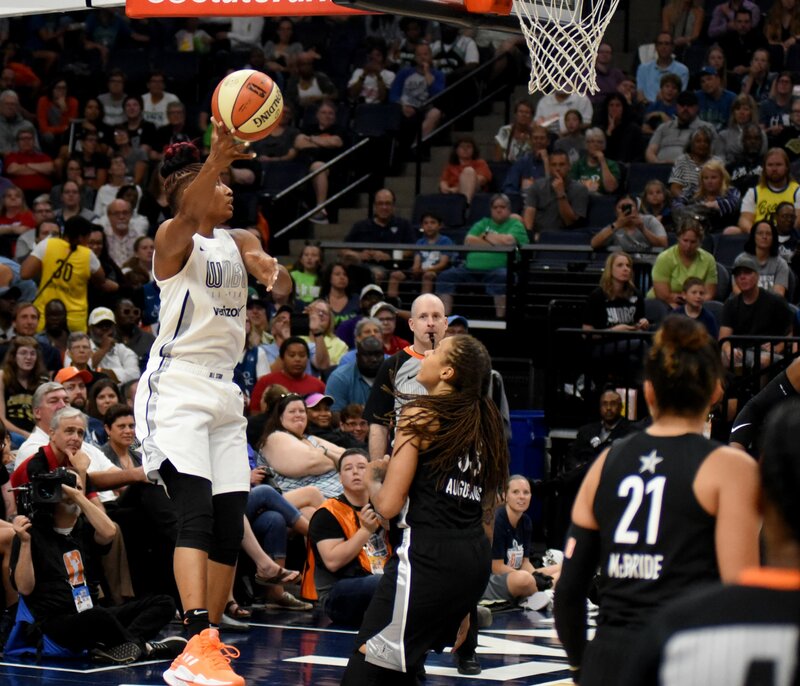 Shortly after the final buzzer, the Minnesota forward was named MVP for the third consecutive All-Star Game behind her 18 points, eight rebounds and six assists. 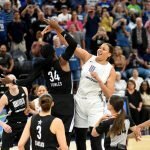 Dallas center Liz Cambage put the finishing touches on the win when the lane cleared in the closing seconds, for a crowd-pleasing dunk. 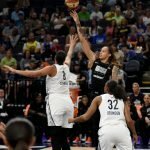 Liz Cambage tips the ball to her teammate to begin the All-Star Game. Maggi Stivers/WomensHoopsWorld. The closing plays capped an energetic day that saw plenty of laughs and camaraderie between players for much of the game. The game got off to a humorous start, as Team Parker won the tip and point guard Chelsea Gray briefly started heading to the wrong basket. Cambage took over at the point guard position for several plays, and helped the team mount a small lead. 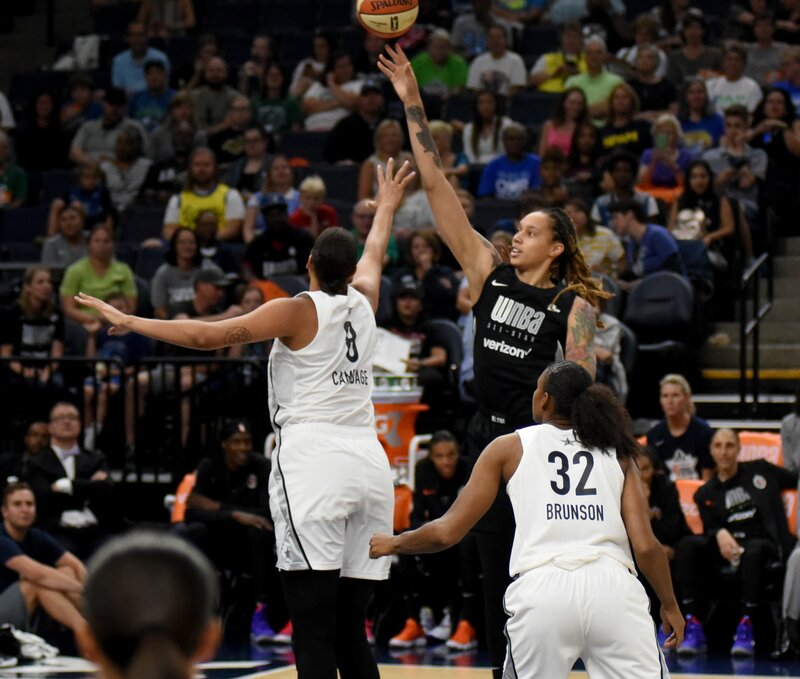 Moore knocked down a fadeaway jumper along the baseline for a 10-7 lead, but Team Delle Donne then ran up the next seven points to take control. Seattle forward Breanna Stewart drained a smooth jumper for a four-point edge, which was the margin by the end of the first quarter, 31-27. 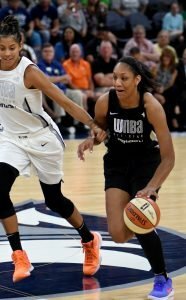 Las Vegas rookie A’ja Wilson turned heads in the second period, as she went on a scoring run that earned her 18 points by the end of the night, through soft jumpers and open layups. 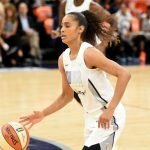 The only member of the loaded 2018 draft class to play in the game, Wilson said she enjoyed every minute. A’ja Wilson drives to the hoop as Candace Parker follows. Maggi Stivers/WomensHoopsWorld. 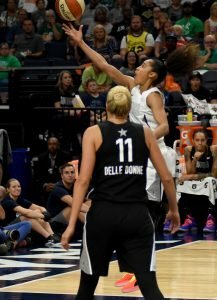 Wilson’s surge gave Team Delle Donne a 41-29 lead, but Moore helped tighten the gap before halftime. 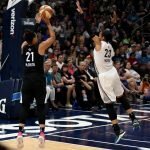 She capped an 8-0 spurt with an offensive putback, and then a half-court alley oop pass to Atlanta’s Angel McCoughtry. 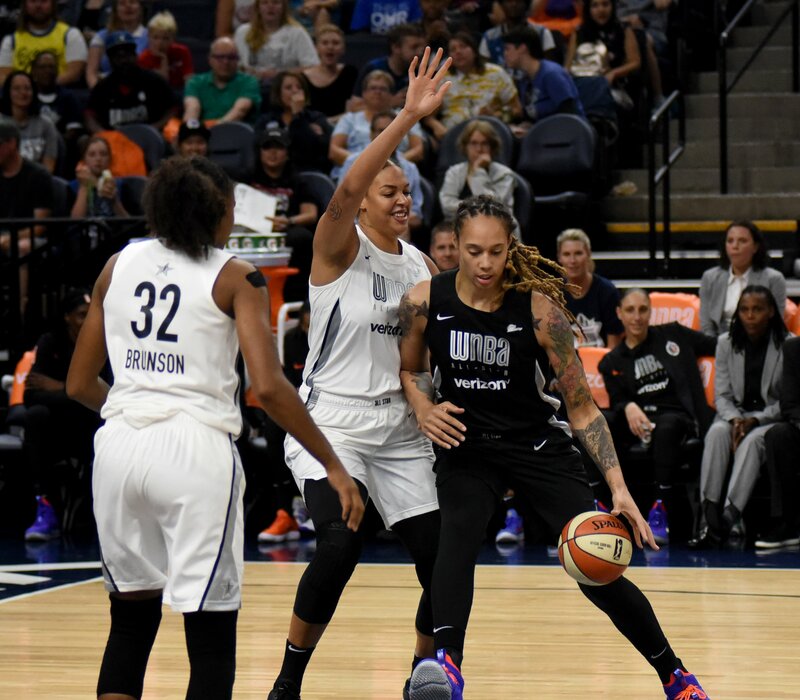 Later, Moore found Chicago’s Allie Quigley for a three and McCoughtry for a fadeaway before connecting on a layup herself, cutting the Team Delle Donne advantage to 54-50 at the break. Quigley showcased her sharpshooting at halftime, defending her three-point contest crown from last year with another one to back it up. She finished with 21 points in the first round, earning her a spot in the finals alongside Las Vegas’ Kayla McBride’s 22 points. The two bested Washington’s Kristi Toliver (20 points), Seattle’s Jewell Loyd (19), Atlanta’s Renee Montgomery (18) and Indiana’s Kelsey Mitchell (15). In the finals, McBride hit a money ball buzzer-beater, which tied Quigley at 18 points, to force a tiebreaker round. 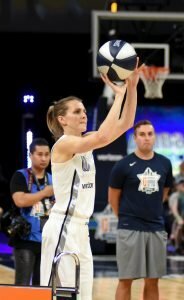 Quigley caught fire in the rematch and put up 29 points, breezing past McBride’s 21 for the title and earning $10,000 for her favorite charity: the Patrick Quigley Memorial Scholarship. Allie Quigley shoots the last rack of balls during the three-point shooting contest. Maggi Stivers/WomensHoopsWorld. Dallas guard Skylar Diggins-Smith sparked a Team Parker run in the third quarter. She found Parker inside with a dime and knocked down a three-pointer on the next possession for a 58-56 lead. 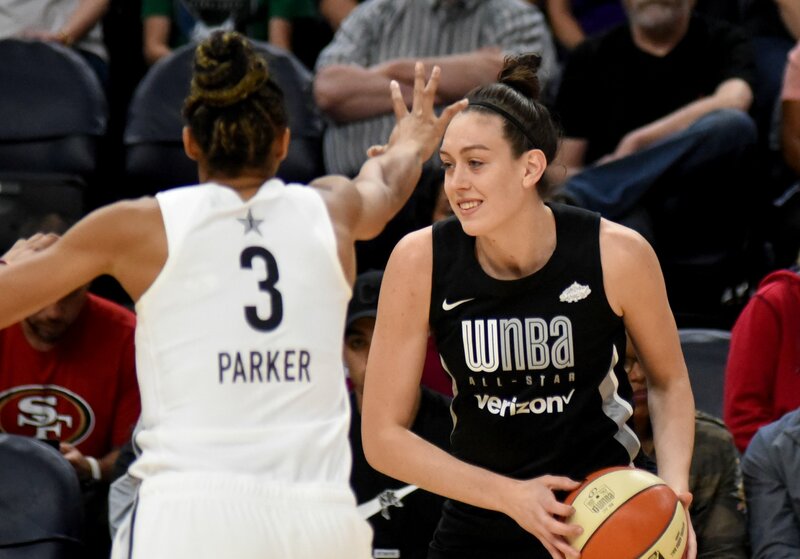 Soon after, Cambage hit a three from the top of the key, and Moore then added a jumper to cap an 8-0 spurt that vaulted Team Parker ahead 70-64. 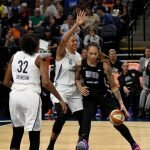 Gray showed off her behind-the-back ball handling in transition, freezing the defense and finding McCoughtry on a cut with a no-look dish that set up an easy layup. The difference expanded when Moore scored on a give-and-go with New York’s Tina Charles, and Team Parker had an 84-78 lead through three. Connecticut guard Chiney Ogwumike pushed the fourth-quarter lead to 14 at 101-87 when Diggins-Smith found her for a layup, but Toliver kept Team Delle Donne in contention by putting on a downtown clinic. 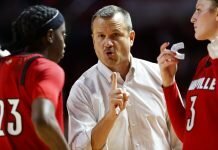 She hit a pair of triples – part of her game-high seven treys – to trim an 11-point deficit to five, and then she found Washington teammate Elena Delle Donne for a corner three that brought the team within two at 108-106. 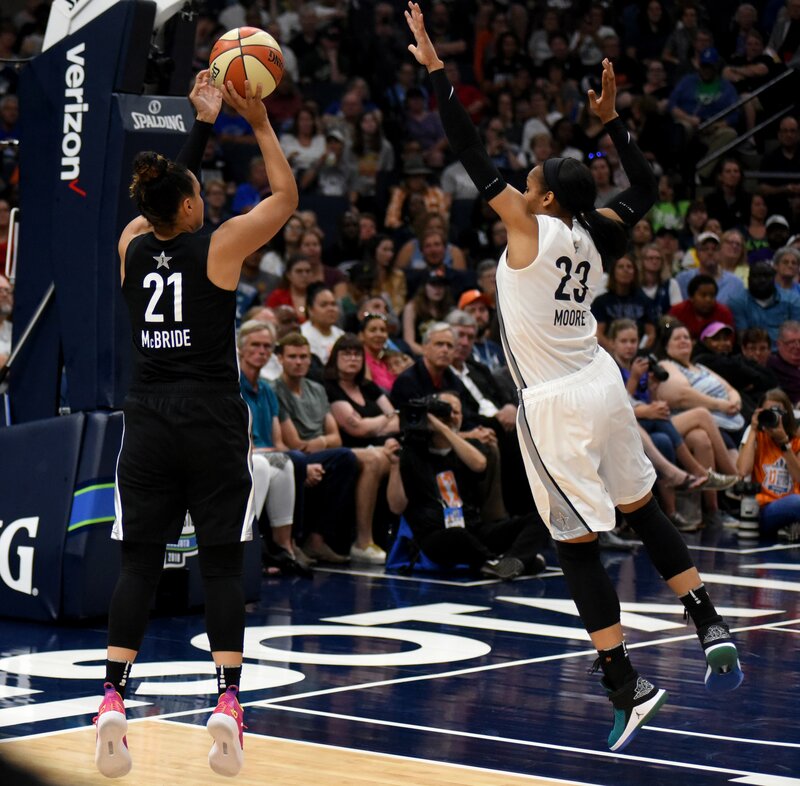 Skylar Diggins-Smith drives and scores in front of Elena Delle Donne. Maggi Stivers/WomensHoopsWorld. 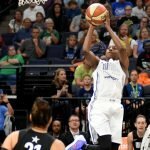 Moore’s late-game shot did earn a three-point response from Toliver – her last of the day, which tied an All-Star Game record. The triple gave her a game-high 23 points, but it wasn’t enough to steal the MVP crown from Moore. 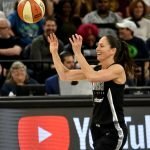 Moore also became the All-Star Game’s all-time leader in points (119) and made field goals (48). 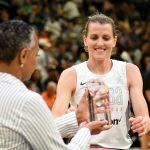 She is the only other player besides Hall of Famer Lisa Leslie to be named All-Star MVP three times and she is the first to win three in a row. 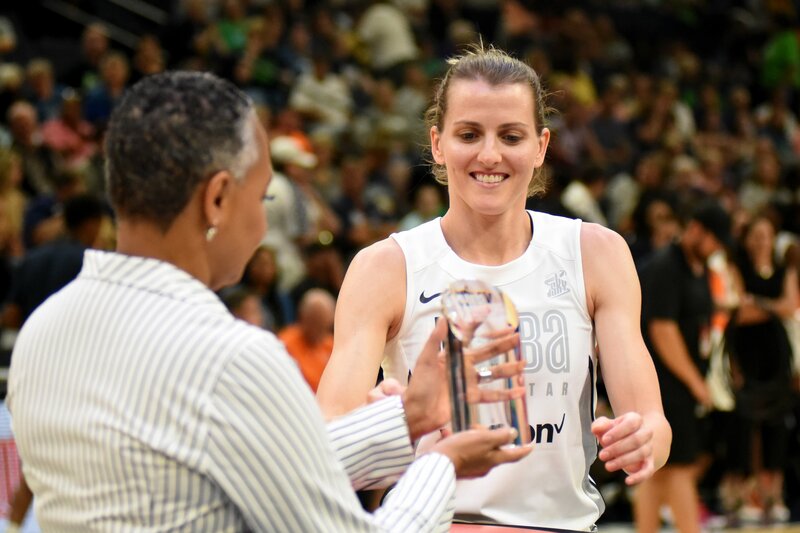 And since the All-Star Weekend took place on her home court, things were a little sweeter for Moore. Jewell Loyd pulls up for a shot. Maggi Stivers/WomensHoopsWorld. 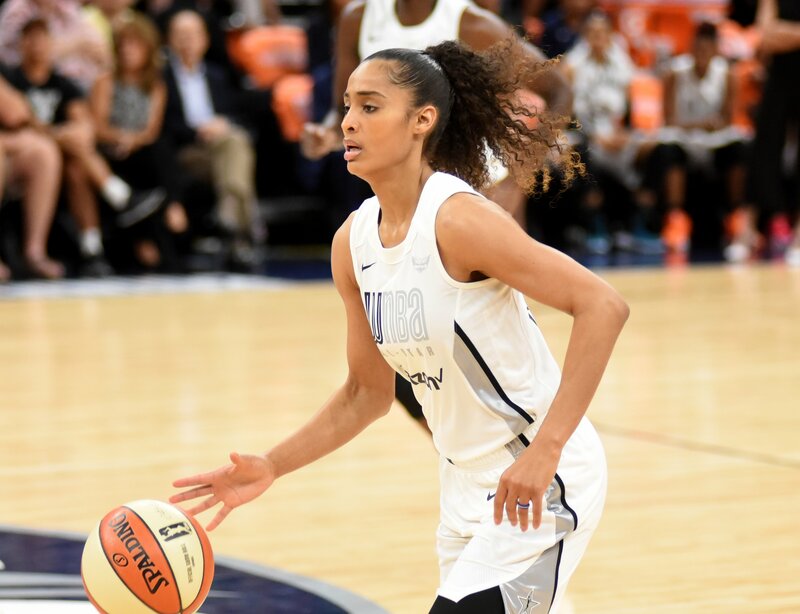 Skylar Diggins-Smith runs the play for Team Parker. Maggi Stivers/WomensHoopsWorld. Angel McCoughtry elevates to score. Maggi Stivers/WomensHoopsWorld. WNBA president Lisa Borders hands Allie Quigley the three-point shooting contest trophy. Maggi Stivers/WomensHoopsWorld. 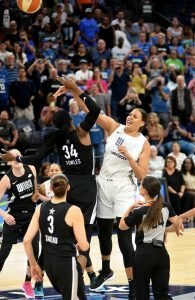 Liz Cambage smiles as she defends Brittney Griner. Maggi Stivers/WomensHoopsWorld. Brittney Griner shoots over Liz Cambage. Maggi Stivers/WomensHoopsWorld. 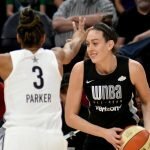 Breanna Stewart looks to pass around Candace Parker. Maggi Stivers/WomensHoopsWorld. 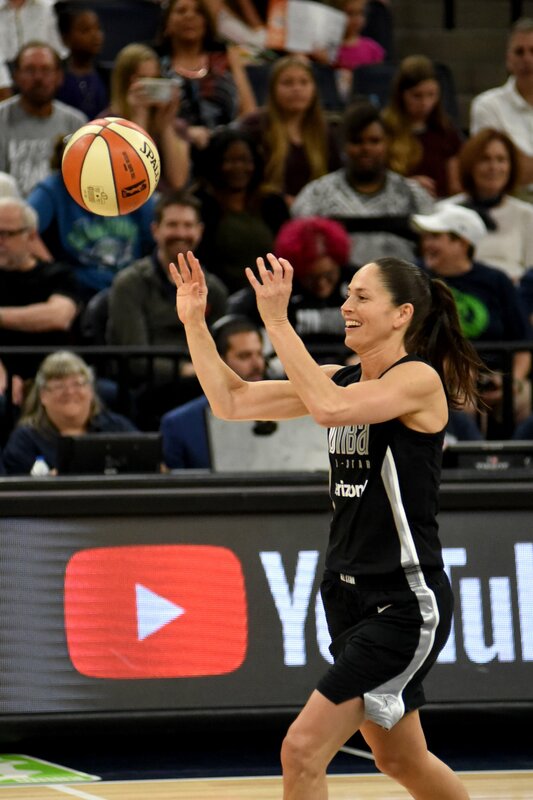 Storm veteran Sue Bird smiles as she passes the ball in her WNBA record 11th All-Star Game appearance. Maggi Stivers/WomensHoopsWorld. 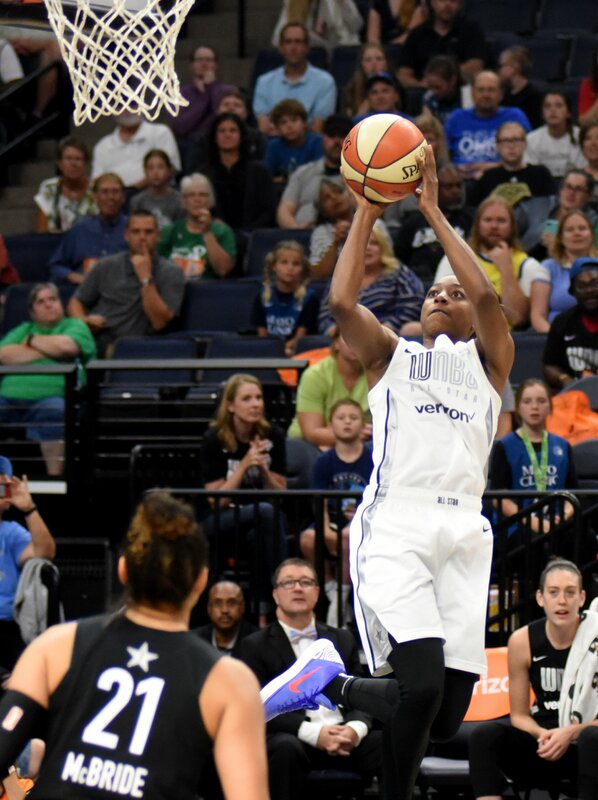 Kayla McBride tries to shoot over Maya Moore. Maggi Stivers/WomensHoopsWorld.